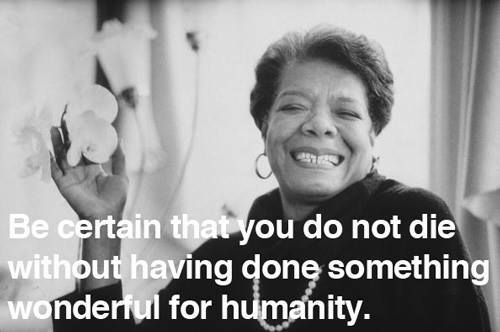 I just heard Maya Angelou passed away. (NY Times Obituary) She has always been a person I admire. I remember reading her books and poems and always being inspired. I have made many mistakes and no doubt will make more before I die. When I have seen pain, when I have found that my ineptness has caused displeasure, I have learned to accept my responsibility and to forgive myself first, then to apologize to anyone injured by my misreckoning. Since I cannot un-live history, and repentance is all I can offer God, I have hopes that my sincere apologies were accepted. You may not control all the events that happen to you, but you can decide not to be reduced by them. Try to be a rainbow in someone’s cloud. Do not complain. Make every effort to change things you do not like. If you cannot make a change, change the way you have been thinking. You might find a new solution. Never whine. Whining lets a brute know that a victim is in the neighborhood. Be certain that you do not die without having done something wonderful for humanity. Thank you, Ms. Angelou for doing something wonderful. Saw this article of her last tweets. I just had to add it. I love this one from May 17. It is both beautiful and simple and it’s message.